You have two days to explore Co.Clare? 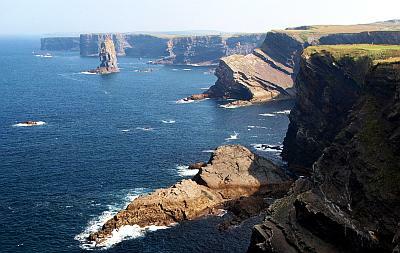 In this case you can split our one day itinerary into two parts and add some sights and explorations, or take the tour for day one in full and the South East Clare tour on the second day! 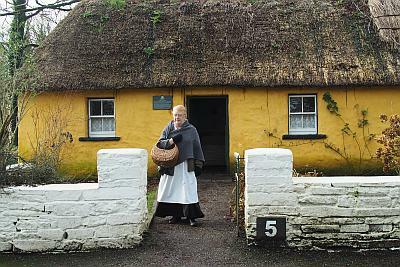 Here are our suggestions how to make the best of two days in County Clare! This tour will take you at least half a day! 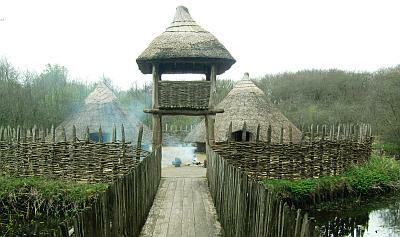 Follow the signs to Craggaunowen - The Living Past Experience, a 16th-century castle and an archaeological open-air museum. A walk through the park will take you at least 1 hr - better if you allow yourself more time. Follow the itinerary of → day one from Lahinch but taking the N85 from Ennis in direction Cliffs of Moher. To make this a full day tour add some additional walks and explorations on the way. 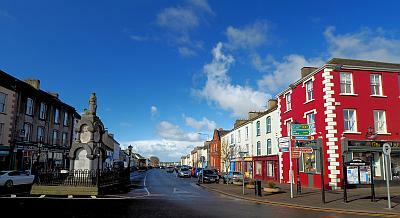 Ennistymon: have a look at the colourful shop fronts and visit the falls, which are especially impressive after rain. Liscannor: Enjoy the best view across Liscannor Bay from the Moher Cottage café. 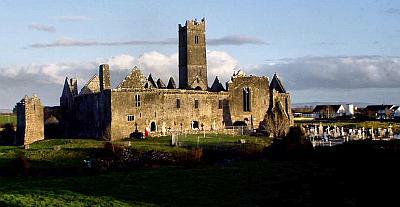 And while you're there you might also want to take a short look at St.Brigid's Well, just opposite. Ballyvaughan: Visit Aillwee cave and Birds of Prey centre or carry on to Bellharbour for the majestic Corcomroe Abbey and the Hazelmountain Irish Bean to Bar Chocolate Makers. 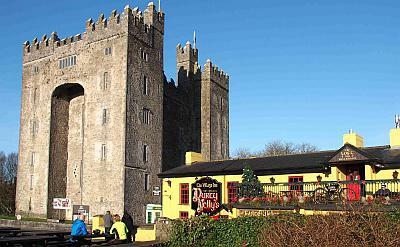 Without own transportation: There are public buses from Ennis to Bunratty and from Ennis to Kilkee. It will take to much of your time to do both on one day, so you have to decide for either one of the options. There's no public transport for Loop Head. This is a full day tour if you take in all the sights/excursions. If you want to include a dolphin watching tour, and/or visit Scattery Island you need to do some phone calls on the day before to find out when the boats depart and fit this into the itinerary below. Allow at least three hours for any of these boat trips/excursions. Dolphin watching from Kilrush Marina: ph (065) 905 1327 . Dolphin watching from Carrigaholt: ph (065) 905 8156. From Ennis follow the N68 to Kilrush (45 - 60 mins from Ennis). If you booked a Dolphin watching tour or the Scattery Island Ferry (see above) you take wide Frances Street leading to the marina. If you got some time before the boat trip take a walk through town or visit Vandeleur Walled Garden (allow at least 30-45 mins). In Kilkee(20 mins) drive through town towards the beach and follow the Wild Atlantic Way signs. These will bring you to the spectacular road along the Kilkee cliffs. There are only a few parkings, but do not miss to stop at any of them for great photo opportunities. Follow the Wild Atlantic Way signs to Loop Head lighthouse (around 1 hour from Kilkee if you take the route as above). Now you can visit the lighthouse or even better walk along the cliffs around the lighthouse. This will take you just half an hour, but with good chances to see dolphins, seals and even whales if you're lucky! The views across to Dingle, Kerry and the vast ocean are amazing anyway. On the drive back from the lighthouse stop after 5 mins. at the Kilbaha Gallery. Here you'll not only find quality crafts but you can also get a wonderful coffee and homemade cakes. Back on the road keep following the Wild Atlantic Way signs along the Shannon estuary to Carrigaholt village (1 hr, more if you spend some time at the gallery). For Dolphin watching tours - see above. Consider calling into the Long Dock Pub and Restaurant for a seafood chowder and a pint of Guiness (unless you're the driver - then at least try the ice cream)! You'll eventually get back to Kilkee (20 mins). From Kilkee drive north taking the N67 to Doonbeg. 3 kms past the village turn off to Doughmore beach. 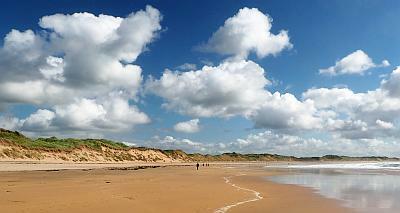 Have a look around one of the prettiest beaches in Clare. (30-45 mins. including the drive from Kilkee). 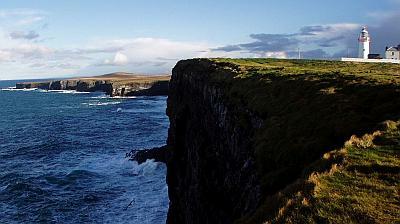 Further north drive past Quilty and follow the Wild Atlantic Way signs to the beach in Spanish Point (20 mins). Time for another picnic, sitting in the dunes watching the high waves rolling in from the Atlantic, or from the café next to the beach! From Spanish Point drive to Miltown Malbay and follow the scenic road directly back to Ennis (1 hour). 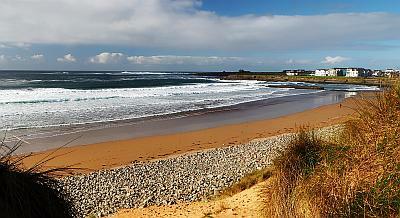 Alternatively stay in Spanish Point, Miltown Malbay or in Lahinch for the night. → Find accommodation in our list of villages!